1/2 Price Special 1100 sq ft 2-bedroom luxury condo next to Bellagio! Ok you found it! Phew!!! Is it possible to find a place so good? A hidden gem? Right in the middle of the Action? Without anyone seeing it or even knowing its there? You can rest now you have Absolutely found what you are looking for. I have absolutely no doubt that this is the right place for you… And here is why. A full condo all to yourself, in a resort with all the amenities that you want and perfectly located. Oh and the other part I almost forgot. Priced at a point that wont break the bank. The Jockey club is sort of a Unicorn. No one knows about it. But right beside the Bellagio hidden amoung the bright lights and huge towers lies this perfect little resort. The proof you say… All the pictures of the Jockey club from the outside are taken from the BELLAGIO WATER FOUNTAINS. If we had used a wide-angle lens you would see the Cosmopolitan and City Center in the back ground and the Bellagio resort to the right. If you are standing on the strip looking at the Bellagio Water show with your feet dangling in the water the Jockey club is to your immediate left. Along the strip Run 100s of double decker buses of which for about $5 per day you can hop on and off of and be at any other resort in under 10 min. If you are going a little further (like the convention center) then the monorail stops right across the street at the Paris hotel. The price you are quoted includes all fees, taxes, parking, and WIFI throughout the resort. Our prices are at a huge discount compared to the same high-end resorts next door. City Center, Bellagio, Cosmopolitan. Yes, the Jockey club is not a 5-star resort like the Bellagio, but it may as well be because as soon as you leave your room you are attached to the city center with free use of the Cosmopolitan Bamboo pool (you see that one in the pics) free use of the tennis courts and inexpensive use of their gym. You can hold your breath and walk to the Bellagio it is so close. The amenities are simply awesome. Fantastic pools, games room, hot tub and all the amenities of a hotel with support staff for easy hotel like check in, security and cleaning staff (weekly or just prior to your stay) If you need more towels, they will bring them. A full condo all to yourself, in a resort with all the amenities that you want and perfectly located. Oh, and the other part I almost forgot. Priced at a point that won’t break the bank. We have 3 Condo Types in this resort. 1 bdm 1 bath Sleeping 4 in a King Bed in the bedroom and a Queen pull out couch. All the bedrooms have locking doors, and you can request a free playpen, highchair or crib. Everything you should need is here, including pool towels at the pool, some hotel soaps and coffee for a day or two to get you started. The kitchen is fully stocked and all linens are included. 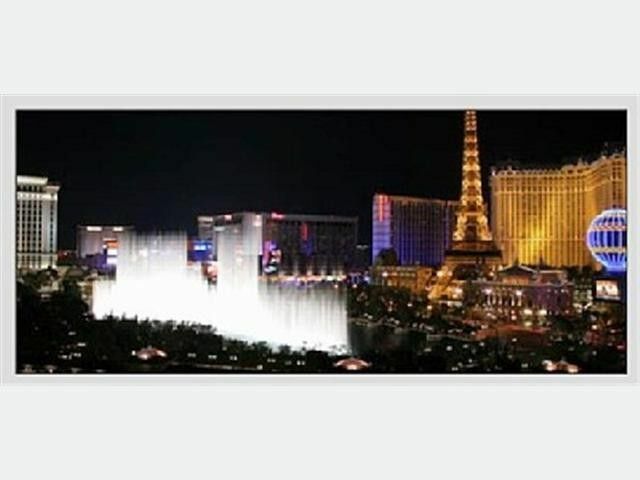 About 50% of our guests get a room with the VIEW of the Bellagio Water show at no extra cost. You will check in with a reservation number we will give you. Like in a hotel. The room is assigned at that time. We have requested a view room however it is not guaranteed. The View rooms cost about 40% more and our guests prefers the lower cost. However, if the view rooms are available at check in about 50% of our guests get the room upgrade for free. Check in is at 4, and out at 11 like in a hotel. If the room is ready when you arrive then you will get it right away (so try to check in when you arrive) if not then you can store your bags free with the valet and use the amenities or wander the strip while you wait. You can coordinate a late check out with the front desk or use the valet for free while you wait. They have a welcome room with free… popcorn, movies, games, kids’ movies and games, books etc. There are more bonuses but I am sure you are now sick of reading this so JUST BOOK IT ALREADY!!! Why this property - If Las Vegas is your destination then this should be your destination in Las Vegas. Unquestionably this is it!! Where else will you find a full condo to yourself in a fantastic resort and at this location. Oh and of course the price. If you want to try check out what the Bellagio or City center will cost. They are the competition. Extra A couple of Tips 1. Bring a Large drinking container and make your own drinks to wander the strip with. It is legal to drink outside on the strip in Las Vegas. 2. Across the street there are Tix4tonight booths which sell last minute tickets to all the show and events in Las Vegas. Save up to 50% 3. Indoor skydiving was one of my favorite things. Most fun / $$$ 4. All Cirque de Solei shows are amazing. I’m not just saying that so my wife will be happy either. 5. They are offering timeshare presentations all over the strip with free stuff to get you to take one. In my opinion it is not worth it. First, they are trying to sell the timeshares at a 20 x mark up on what you can find them online. 2nd, they can be very intimidating and will ruin your overall experience. So, unless you really want to just say no. GETTING Around From the Airport you can get a shuttle for about $6 or a taxi for about $40 to get to the hotel (tell the taxi to go via the strip. They won’t want to as it takes a little longer, but the cost is the same and it is way more fun and the right way to enter Las Vegas. Especially at night. You don’t need a car but they are inexpensive to rent, just remember to bring your insurance to prove you have it. The double deuce bus, $5 goes everywhere in Las Vegas. they pull up in front of the building and come by every two min. (as a side not, just riding on the Top of that bus, with a cold drink in your hand watching the people and the lights roll by jumping on and off as you please are a great way to see it all and for only $5) or the monorail stops at the Paris hotel (right across the street) and takes you further out and is about a 5 min ride to the convention center. Free underneath the building, or for a nominal fee you can have the concierge park it for you. Beds and pillows were very comfortable. Hide-a-bed not so much(but then what hide-a-bed is). Had plenty of closet space for anyone that needed to hang things up and to store suit cases. Even though the couch was a bit dated it accommodate several people. The house keeping staff was very efficient and friendly. All in all we very much enjoyed the stay. We would stay again. I brought my family with me so I was looking for a quiet place to stay (which can be tricky for Vegas) and this did the trick since it's not in a casino. No views but it was okay...if you want a view then go outside and enjoy the city! I loved the location too since it was off the beat and path but right in the middle of where we wanted to be. Thanks! The only down side is the time share folks... they are really trying to get you to buy one and go to their seminar so you have to stand you ground to say no. Yes there are timeshare folks all over on the strip. They can have enticing prizes but are never worth the pressure tactics you have to endure to but something you can usually find online for free. Thanks for choosing to stay in our condo. There were 6 of us and we had a great time. The place was large and roomy. Perfect location to pretty much everything. I made the reservation with Mark, as he was very responsive to all my emails. I felt comfortable to try this for the first time. I arrived in Vegas on Friday (6:15 pm) only to find out that my reservation was not booked, so security will not let my 2 families enter the premise. I showed them the string of emails, the payment etc., but the only way was to have Mark call to verify. I must have called Mark 8-10x times, emailed him, text him etc. There was no response, so the families waited in the lobby for 3 hours. Can you image 4 kids just sitting in the small lobby. I didn't know what to do, so I decided to use the hotel lobby's computer to book another hotel room anywhere in Las Vegas. Of course the rates were extremely high (being last minute). I was about to make a reservation, when the security manager came and told me that he would let me in (even though he is breaking the rules). Finally inside we started to unpack, kids had to use the restroom, but there was no soap or toilet paper or paper towels. Now really frustrated, I go downstairs to get some. By now it's past 9pm and we missed our dinner reservations. Mark finally was able to get in touch with me 3 1/2 hours later and gave me a person in Vegas I can call for anything. I wish I had her number from the beginning. That evening we went to bed and the kids decided to sleep together in the living room sofa/beds. There was no linens and the comforters were dirty. I also noticed we didn't have enough towels, so I went to the pool area and snagged a few. The next day, I called my contact and she was very nice. she gave me soap, toilet paper, and clean linens. I asked about shampoo, but they do not supply that. She actually came to the room and saw the mess and quickly called housekeeping. She said she keeps supplies in this closet (living room) but when she opened it, there was no supplies. In fact she saw dirty towels, dirty linens etc (pretty gross, won't open that door again). Everything was smooth sailing from then on. The place is clean and was enough room for everyone. Outdated furniture, but it was comfortable. The location was the key, it is located right behind Cosmopolitan and walking distance (300 feet) from the strip. We enjoyed the pool and valet was really easy. Will I stay there again? I really need to contemplate. If the price is right and I'm on a budget, I probably would, but I will probably ask Mark for some concessions for a nightmare of a start. This was my second time staying at the Jockey Club. Last time I had a view of a brick wall, this time though I had a two bed suite, and the hotel managed to get us a room with a view. The suite was modern and clean and very spacious. Dealing with Mark and all my questions was very easy and reassuring. On the 50 yard line. There is no better location for playing on the Strip in Las Vegas, without paying astronomical prices. Between the Bellagio and City Center. The building has a view of the Bellagio water works show.